Researchers are gathering big data by attaching tiny backpacks to thousands of bees to shed light on the global collapse of wild populations. 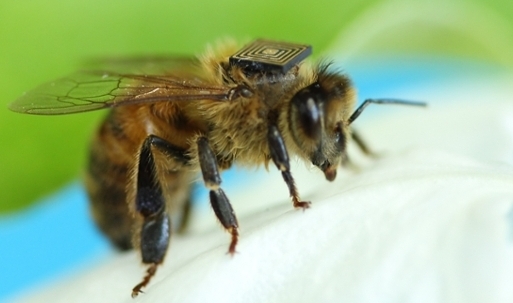 Micro-sensors attached to thousands of bees to help investigate their health. Bees are under threat globally from pathogens, pesticides and agriculture intensification. Monitoring the behavior of these pollinators can combat population decline. There’s a big buzz coming from the land down under. Researchers from the Commonwealth Scientific and Industrial Research Organization (CSIRO) in Australia are harvesting big data from micro-sensors on thousands of bees in the state of Tasmania. The research program is the first of its kind and is part of the Global Initiative for Honeybee Health, an international collaboration of researchers, beekeepers, farmers, and technology companies. Bees play a vital role in pollinating food crops. Roughly one third of the food humans consume each day relies on the little creatures, amounting to billions of dollars in the global economy. However, bee populations are facing threats from a number of factors including pathogens, pesticides, and agriculture intensification. Down under, biosecurity is a serious issue. Because of Australia’s geographic isolation and subsequent fragile ecosystem, imports are tightly regulated. One of the pests that Australia is trying to keep out is the Varroa mite – a parasite that transmits pathogens which can rapidly lead to the death of bee colonies. Due to their size, monitoring how bees spend their time has traditionally been a struggle for scientists. Researchers have tried painting individuals with color codes and monitoring their movements via cameras – a tedious task. But with the new radio-frequency identification (RFID) tags the process is much easier. 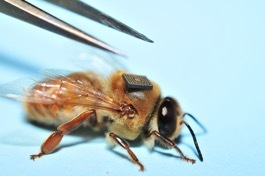 The micro-sensor ‘backpacks’ – measuring 2.5mm x 2.5mm and weighing about 5 milligrams each – are attached in a matter of seconds and record when the bees pass checkpoints. This data is then shared with scientists worldwide via the cloud to build models revealing how bees interact with the environment. Researchers use this information to analyze the effects of stressors such as disease, pesticides, air pollution, water contamination, diet, and extreme weather on the bee’s ability to pollinate. Bees are considered fairly predictable in their behavior hence deviations can indicate stress or environmental changes. Modeling the bees’ movements therefore can help to identify the cause of the change and protect the colony. The CSIRO are now working with Brazil’s Vale Institute of Technology to utilize the sensors in the Amazon so they can compare behavior between the regions. Further work is being done to make even smaller sensors – 1.5mm x 1.5mm – which will interfere less with the bees’ behavior. But the reduced size of the sensors presents a new problem – small battery technology is not powerful enough. The researchers plan to make small enough sensors to be used on fruit flies and mosquitoes in the future, enabling information to be captured all around the world in unprecedented density.